It was the perfect metaphor. Republican presidential candidate Donald Trump, continuing his upward surge in polling, spoke against the background of the U.S.S. Iowa, the World War II-era battleship's massive cannons at his back (perhaps unintentionally pointed at the press) and with spotlights trained squarely on him. "The veterans hospitals, obviously they have problems, they're not properly run," Trump said, wearing his classic red "Make America Great" hat. "We're going to create a whole new system, we're going to take the system apart, and if they're not doing the job, the veterans are going to go to private doctors, private hospitals." He also promised to build a military "so big and so strong and so great, and it will be so powerful that I don't think we're ever going to have to use it." "Nobody's going to mess with us, that I can tell you," he said. The details of his military plan will have to wait; the businessman said he would "come out with some plans in a very short time." Trump also said, "We have illegal immigrants that are treated better" than veterans in the U.S., while hundreds of demonstrators protesting Trump's immigration stance were screaming off the starboard side of the ship. Some of the signs read "Deport Trump" and "Trump Not Wanted Here," while some chanted, "Donald Trump -- he's a racist!" Trump did not address the protesters. Trump's record on veterans issues was called into question earlier this year when he denigrated the war record of Sen. John McCain, R-Arizona, saying he was only a war hero because he had been captured. But last week, he called on CNN to donate the profits from Wednesday's Republican debate to charities that benefit veterans. "You should view the second debate broadcast as a public service and not accept the massive profits that this airing will generate," Trump wrote in a letter to CNN president Jeff Zucker. "I want you to remember, notwithstanding the fact that there's one guy absolutely denigrating an entire group of people. Appealing to the baser side of human nature. Working on this notion of xenophobia in a way that hasn't occurred in a long time. Since the Know-Nothing party back at the end of the nineteenth century," Biden said. During the speech, Trump said he was "happy" that he brought illegal immigration to the forefront. Also on Tuesday, conservative group Club For Growth unveiled a massive barrage of ads that will be aimed at Trump in Iowa. He brought the traditional bluster that has left establishment Republicans at a loss and upended the Republican primaries but didn't mention the Club For Growth. His lasted just 15 minutes. On Monday night in Dallas, Trump spoke for an hour. Tickets were free from veterans, but ranged from $100 for general admission to $1,000 for "premiere seating" for anyone else. The crowds enthusiastically cheered on the front-runner before tomorrow's Republican presidential debate at the Ronald Reagan Presidential Library in Simi Valley. Neurosurgeon Ben Carson is gaining on Trump, a new CBS News/New York Times poll shows, climbing to to just four points shy of Trump's 27 percent support among Republican primary voters. When asked after the speech how he felt about Carson gaining on him, Trump told CBS News, "He's not." Rain swept the Los Angeles area earlier in the day but cleared in time for Trump's speech. The event was hosted by the Veterans for a Strong America, which gave him its official endorsement in the race. 69-year-old Kit Carson, who has spent his whole life on Newport Beach, was decked out in an all-black suit and a black "Make America Great" hat. "He's the only that I'd even consider. He's an American, not a politician," Carson said. "Our politicians are coercive crooks who live off of you and me." Orly Taitz, famed for her quest to prove that President Obama wasn't born in the United States, handed out flyers to reporters during the rally touting her case saying that she had "provided the court undeniable proof that Barack Obama, aka Barry Soetoro, aka Barry Soebarkah... fabricated IDs as proof of his identity and eligibility for the US presidency." Robert Brower, of Irvine California, is a Vietnam veteran who doesn't know who he is going to vote for yet. "He's shaking up the whole candidate selection process this year," Brower said. 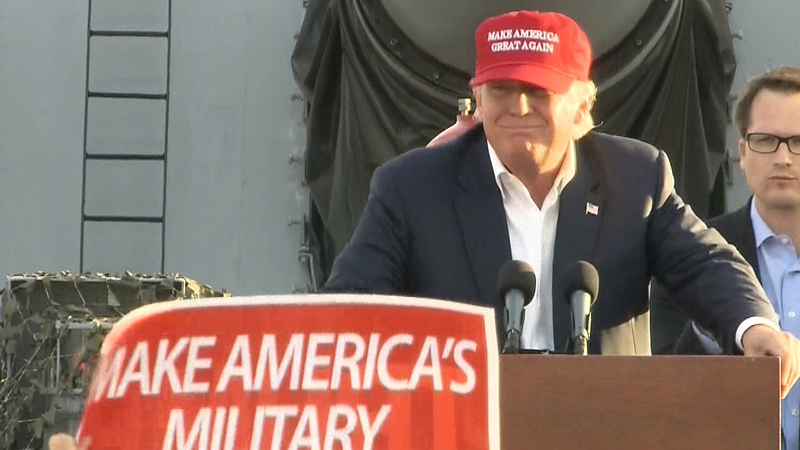 "He wants to do a great deal of things for veterans. There's needs for healthcare, helping veterans get going with small businesses, GI bill, getting your education, it's taking too long." Before Trump took the stage, Wink Martindale, famed host of game shows such as "The New Tic Tac Dough" and "The New High Rollers" in the 1970s, warmed up the crowd. After the national anthem, chants of "USA!" rung out -- juxtaposed with audible protesters stationed outside the battleship. Along with the usual Make America Great signs typically seen at Trump rallies, one man wore a hat with a badge stuck to it. It said, "We the people are mad as hell." CBS News Political Digital Journalist Sean Gallitz contributed to this story.